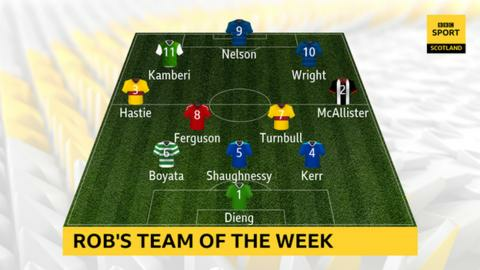 Who made Rob Maclean's youthful team of the week? Scottish Premiership action resumed at the weekend and BBC commentator Rob Maclean picks his standout performers. Formation 3-4-3: Seny Dieng (Dundee); Jason Kerr (St Johnstone), Joe Shaughnessy (St Johnstone), Dedryck Boyata (Celtic); Kyle McAllister (St Mirren), David Turnbull (Motherwell), Lewis Ferguson (Aberdeen), Jake Hastie (Motherwell); Scott Wright (Dundee), Andrew Nelson (Dundee), Florian Kamberi (Hibernian). Dundee did what St Mirren failed to do on Saturday and that's hold on to a 2-1 lead. Seny Dieng's double save late on against Livingston was crucial. The on-loan QPR goalkeeper got his chance when Jack Hamilton was out of action and he's grabbed it with both gloves. Most of the Ibrox headlines on Saturday focused on dropped points for Rangers but the goalless draw was significant for St Johnstone as they ended a run of five straight defeats. Jason Kerr was again an eye-catcher for the Perth team with another quality showing at the back. I wrestled with which of the Saints central defenders I was going to include and the answer is to pick both. Joe Shaughnessy rarely has a bad game as far as I can see and he came close to heading in the winner for St Johnstone. These two are a top pairing in defence. The much-maligned Dedryck Boyata gets the third place in my defensive set-up. There was a reason Celtic goalkeeper Scott Bain had little to do at Rugby Park on Sunday. The players in front of him limited Kilmarnock to very few scoring chances with Belgian international Boyata running the show. Talented 20-year-old Kyle McAllister gave a glimpse of what he's got when he lashed a left footer past Aberdeen's Joe Lewis on Saturday to put struggling St Mirren 2-1 in front. The Paisley team had to settle for a point in the end but the sparkle of McAllister, back on loan from Derby County, bolsters their belief that they can still escape relegation. David Turnbull's late winner for Motherwell against Hearts on Sunday was more about keeper Colin Doyle's howler than it was about the teenage midfielder's strike from the free-kick. But there was nothing freakish about Turnbull's composed and commanding performance right at the heart of the action. Aberdeen weren't too chuffed that Lewis Ferguson's old man Derek broke the news on BBC Radio Scotland's Sportsound that his boy's about to sign a contract extension. The 19-year-old midfielder is consistently outstanding and scored his seventh goal of the season against St Mirren on Saturday. My all-under-21 midfield four is completed by young man of the moment Jake Hastie. His five goals in six games tell only part of the story. The speedy Motherwell forward looks like he's about to make something happen every time he touches the ball. An exciting prospect. Dundee needed to add some quality in their battle for survival and the loan signing of Aberdeen's Scott Wright could make all the difference. He scored against Livingston on Saturday with a sensational free-kick and his cross created the other goal. Andrew Nelson, 21, has featured only six times for Dundee and has four goals to his name already. The former Sunderland striker looped in a header in the 2-1 win at Livi which hauled the Dark Blues out of the bottom two in the Premiership. New Hibernian head coach Paul Heckingbottom certainly got a reaction out of Swiss striker Flo Kamberi in his first game in charge. He worked hard, ran the channels and scored in the 2-0 defeat of Hamilton Academical. Kamberi's a big player in Hibs' push for a top-six finish.